25% discount off the list prices for all remaining dates at La Valle between 4th July – 29th August 2015. Flexible weekday arrivals possible. Minimum 3 nights. 7 apartments with shared pool and tennis court. Just 1 km from the small town of Montaione with all kinds of shops etc. Visit San Gimignano, Volterra, Florence, Siena, the Chianti winemaking area and the beautiful Tuscan coast. From: Gillian at One Stop Italy. Bookings and Enquiries: +44 (0) 1603 812212. I’m going to talk today about a part of Italy very close to my heart, and that is the Val di Chiana in Southern Tuscany. Less well known than its blatantly more commercial neighbour Chianti, it seduced me with its subtle charms on my very first visit in 1988, and I have never found anywhere in Italy I prefer. 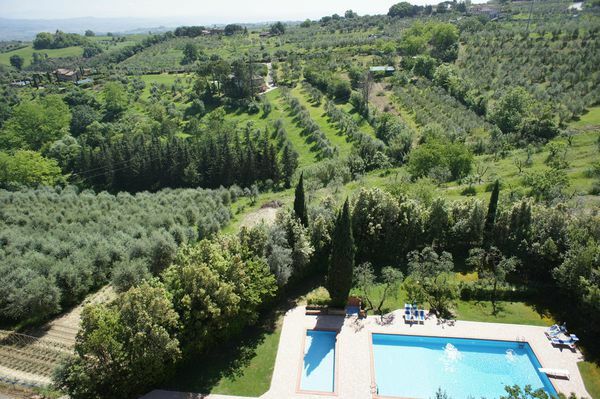 Essentially it’s a large fertile valley full of vineyards and olive groves stretching from Arezzo to Cortona, dotted with medieval hilltop villages. You can spend weeks pottering around here and never get bored. And there’s so much to do for day trips: Florence is about an hour on the train, Siena a 40 minute drive, similarly a short drive to Montepulciano with its streets lined with wine shops and Pienza, designed by Pope Pius II in Renaissance times. Lake Trasimeno and Assisi are easily accessible too. For this reason we often recommend holiday houses in the Val di Chiana as an ideal, gentle introduction to Tuscany for first-timers. Would you like to visit the Val di Chiana? Contact us here and we’ll talk through some ideas with you.